Traditional Rainbow Majestic Tabs are a brilliant way to locate Bible passages. They assist Bible study by ensuring that you find passages quickly and easily. Traditional Rainbow Majestic Bible Tabs by Na Na was published by Ellie Claire in August 1999 and is our 1315th best seller. The ISBN for Traditional Rainbow Majestic Bible Tabs is 084371583461. 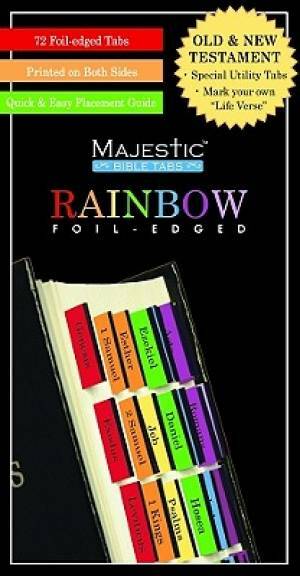 Be the first to review Traditional Rainbow Majestic Bible Tabs! Got a question? No problem! Just click here to ask us about Traditional Rainbow Majestic Bible Tabs.